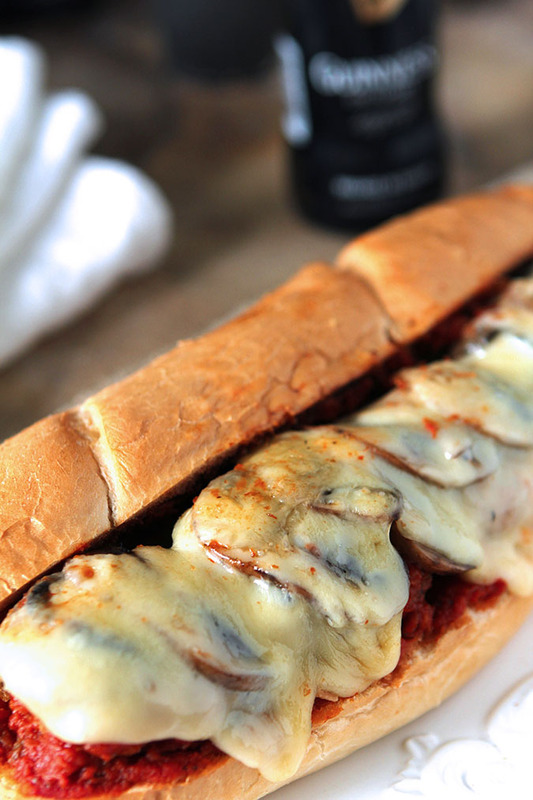 Whether it’s for the big game, company, or a family event, these Meatball Sub Sandwiches with Mushrooms and Cheese will be welcome by all! I’ll be perfectly honest, I had no intention of making these sandwiches the feature of a blog post. I recently posted about my favorite recipe for Meatballs that I serve with Spaghetti and shared that I love making a big batch and freezing some for later. 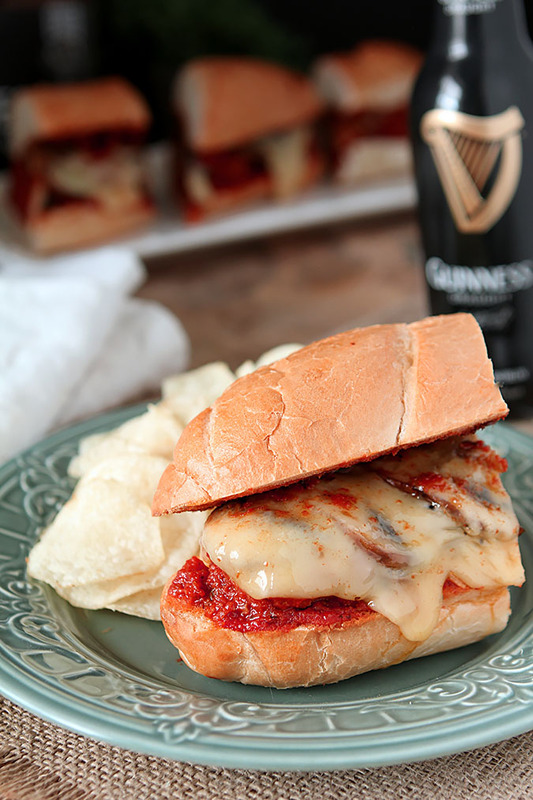 The later turned out to be for these sandwiches and they were so good I hope you’ll find this recipe worthwhile too. The truth it’s just what I did to put together a sandwich…is that a recipe? So while I do love using my homemade meatballs; I know lots of friends that buy those packages of them from Costco too…so yes, use those if you want. While I made my favorite Tomato Sauce using a tried and true recipe; again, use what works for you. Have a favorite marinara…either your own or a jarred sauce? Use it. This is really about putting together a great sandwich for a crowd, not about you spending the day in the kitchen, right? I actually had some friends showing up to watch (and suffer) for a Broncos game and it shows. Trying to get good photos when people are standing at the ready to eat? Not easy. That blurry shot above? Oops! Anyway; this is really just a post about how I put one of these together. I like to brush some olive oil and butter on the bread and toast it so it doesn’t get soggy. I like to add sautéed mushrooms or onions or both. Today was mushrooms only; I have a friend who hates onions. I can sneak them by him in sauces but sautéed onions? No way. I will occasionally acquiesce since he will forever be the guy who spent half a day digging a hole for a huge tree in my back yard; I call it The Casey Tree. No onions? No problem! 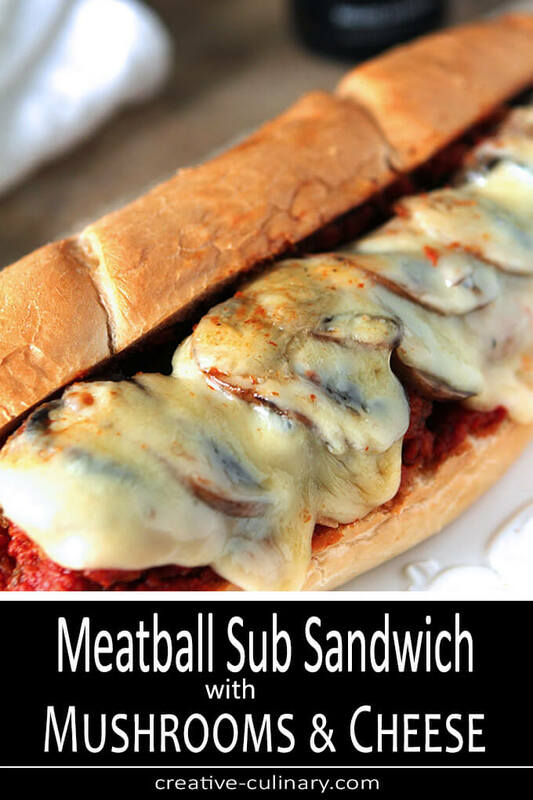 My favorite sandwich from a sub shop is Meatball Sub Sandwiches with Mushrooms and Cheese and now it's even better made at home. These meatballs are simply the best; adding mushrooms and cheese sure didn't hurt! Slice the French bread in half. Melt together the olive oil and butter and use a pastry brush to brush the cut surface of the bread with the melted mixture. Cut the garlic cloves in half and rub the tops of the bread with the cut halves. Bake for approximately 10 minutes until the bread surface is toasted. Remove from oven; leave oven on. While the bread is baking, combine the spaghetti sauce and meatballs in a large pan on medium heat. Bring to heat, then simmer for at least 10 minutes. Melt 2 Tablespoons of butter in a medium skillet, add mushrooms and saute for 5-7 minutes, until softened and moisture has cooked off. When the bread is toasted, remove it from the oven. 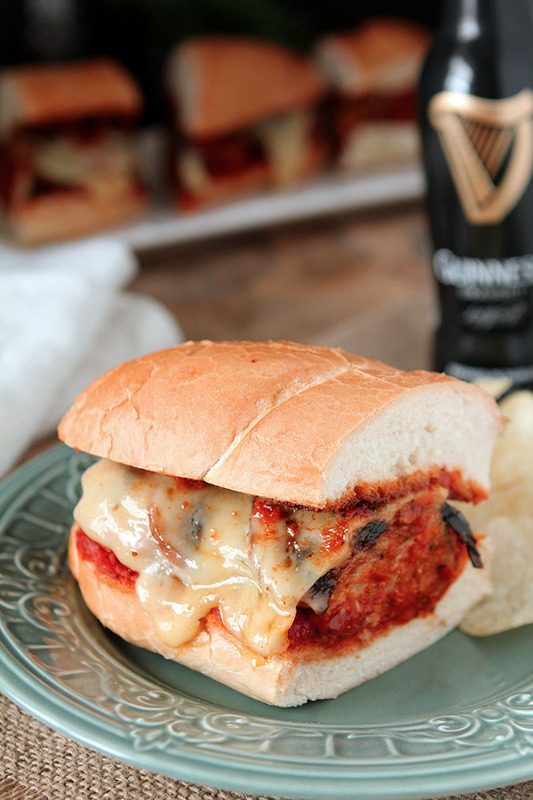 Top with meatballs and sauce, then mushrooms and finish with the Swiss cheese. Return the loaves to the oven and cook for an additional 5 minutes or until the cheese has melted. Remove from oven, slice and serve.